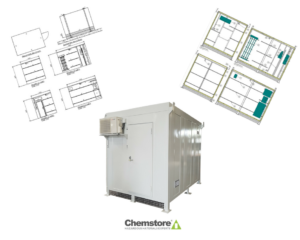 Earlier this week Chemstore were proud announce the completion of the first batch of TER (telecommunications equipment rooms) units for Irish Rail. This is part of a two year national contract secured by Chemstore. This project is being closely managed from design phase all the way through the production & delivery ensuring the highest level of quality is delivered. This key contract is a testimony to our constant goal to develop and improve solutions for the safe storage of hazardous material and critical equipment. It outlays a new market for Chemstore to serve and working with such a key national organisation for transport is a proud undertaking for the Chemstore team. The purpose of this project was to meet Iarnród Éireann’s requirements for TER’s for use at a number of locations on the rail infrastructure to accommodate railway telecommunications equipment & technology. The equipment room comprises of a concept of relocatable buildings, comprising of a single room with no raised sub-floor. One standard room is sized as follows: Internal measurements 3.6m (L) x 2.4m (W) x 2.6m (H). The equipment rooms fully comply with the BR 1615 specification. There is one Mitsubishi wall mounted inverter heat pump and air conditioning cassette unit has been fitted to each unit delivering 2.5Kw on cooling and delivering 3.2Kw on heating. A single zone fire alarm system with smoke detector has been fitted in the room complying with BS 5839 and current Irish legal requirements. All fluorescent fittings inside the building incorporate battery back-up lighting providing three hours backup. All external bulkhead lights also provide three hours backup. All light fittings are rated to IP65. This project required extensive planning to guarantee that each design criteria was produced for our client. 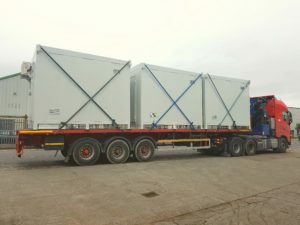 The detailed specification requirements were closely assessed by our highly skilled design team and the TER units were produced and managed via our ISO 90001 accredited Quality Management System ensuring the end product was exactly what Irish Rail required.